Do I Need a Plot Plan or Site Plan for Real Estate Closing? Every real estate transaction produces thick ream of documents completed beforehand or signed at closing. Is a plot plan one of the required docs? Will a plot plan satisfy the mortgage lender about the property’s size and features and that there are no encroachments that could lead to costly liability later? Are there other uses that make a plot plan attractive? A plot plan might be necessary and will certainly be useful when selling property or getting a mortgage. The benefits come at an affordable price. For this discussion, it’s helpful to know that a plot plan is the same thing as a mortgage inspection plan. In other words, the plot plan gives the lender an accurate view and understanding of the property it is providing a mortgage for. A third common term for the document is site plan. Because of the important information included on site plan drawings, they are accepted by banks and other lending institutions and by municipalities everywhere for approving development plans and issuing building permits. A legal land survey is prepared using complex and precisely accurate equipment such as a Theodolite total station for measuring angles and distances, GPS/GNSS scanner and similarly sophisticated tools. 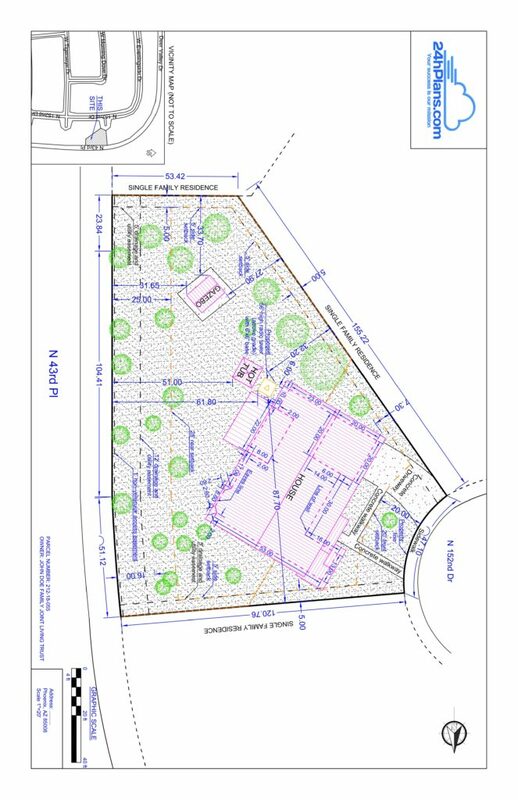 A plot plan is developed more simply using visual estimations (eyeballing distances) or distances determined with a tape measure or measuring wheel. If aerial or drone images are available, they can be useful in creating a site plan. The information obtained is merged with details available on the recorded deed at the Register of Deeds office and the legal property description. This enhances the plot plan’s accuracy and usefulness. A land survey is meant to be precise to the inch; a plot plan is considered usable when accurate to within a foot or two for most distances other than setbacks, which need to be very precise. Note: A setback is the distance off the property line that a dwelling or other structure must be. These pros and cons will help you decide if a plot plan, aka mortgage inspection plan, is sufficient for your purposes or whether a legal survey would be better. Where to Get a Site Plan? Certified site plans can be produced by engineering firms that provide land survey services, but that’s usually overkill and very costly ($1,000-$3,000 is common). A more cost-effective and just as reliable approach is to order a plot plan from 24hPlans. The plan will have the level of detail you want, simple to complex, for potential buyers as you market the property. Buyers can then use the plan when applying for a mortgage from their lender or afterwards applying for a permit to develop or alter the property. In their mind, it’s one less hassle they must deal with (even though obtaining a plot plan is really a simple process). Do you need a plot plan at a real estate closing? If the mortgage lender wants one, then yes, it will be necessary. Even when not required, you can see that a plot plan has many useful purposes in marketing the property and assisting a buyer in making the most of it for their purposes.